The unification of CPN-UML and CPN (Maoist Center) scheduled for April 22 to mark the establishment of the first communist party in Nepal looks set to be postponed in lack of dialogue between the two parties at the top level. A Maoist leader talking to Setopati said the possibility of unification on April 22 has almost ended. The leader pointed that Prime Minister (PM) and CPN-UML Chairman KP Sharma Oli and Maoist Center Chairman Pushpa Kamal Dahal have not met since Oli’s India visit, and Maoist Center has not convened any meeting to endorse the impending unification with less than a week remaining for the scheduled unification. The two leaders were scheduled to meet on Wednesday but it did not materialize after Dahal fell ill. Dahal left for Chitwan the next day while Oli went to Rara on Friday. Oli returned to Kathmandu on Sunday but Dahal left for Sukute, Sindhupalchowk to take rest. 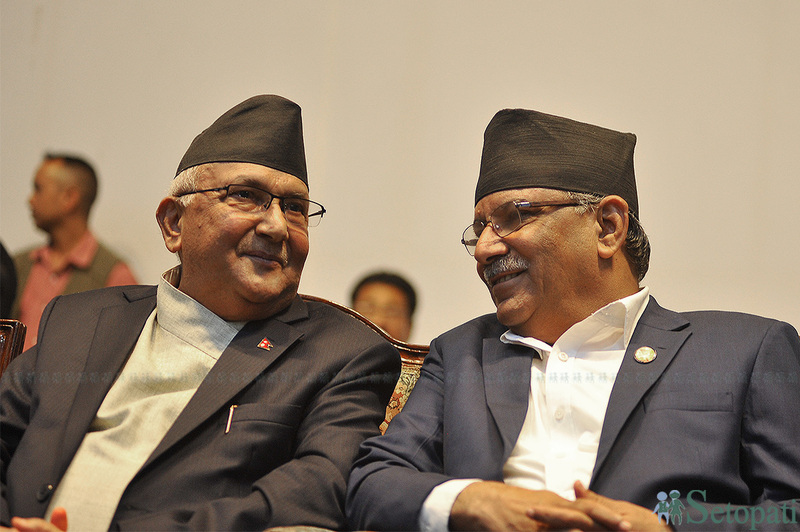 They finally met at the PM’s official residence in Baluwatar Monday after Dahal returned from Sukute in the morning and have decided to hold the meeting of the coordination committee for unification on Tuesday. “It may not be exactly impossible if the two leaders insist for unification on April 22 but both of them will have to get it endorsed from their respective parties. Preparations for unification program will also have to be made. I, therefore, feel the possibility of unification on April 22 has ended. The leader pointed at the lack of meeting between the two leaders who have guided the unification process right from the beginning just one week prior to the scheduled unification. “UML at least has called meetings of standing and central committees. But our party has not even called any such meeting,” the leader added. The two parties currently differ on two important issues about unification. Maoist Center says there should be equal representation in the standing, politburo and central committees but UML disagrees. The task force including leaders from both the parties has almost agreed on a 300-strong central committee. UML central committee currently has 209 members and UML leaders have proposed to add Maoist leaders to take the number to 300. UML argues there cannot be equal sharing in the central committee after the two parties shared tickets in 60:40 proportion in the recent federal and provincial elections, and candidacy for the National Assembly election in 70:30 proportion. Maoist Center disagrees and argues that doing so would seem like a takeover by UML instead of unification, and proposes that unification should be done in a manner that self-respect of both the parties is honored to make the unified party strong even in the future. The task force failed to agree on the issue and decided to send it to the top level. A UML leader told Setopati that unification cannot be done on equal terms as the election results have also showed that UML is bigger than Maoist Center. The leader stated that it would also not be possible to not keep sun as election symbol. Maoist Center does not accept that.